Ricky Gervais is to revive his David Brent character for two The Office Christmas specials. The creator and star of the TV show had already told fans that he would not be writing another whole series following the success of the first two. But he told Heat magazine that The Office will be back for two festive programmes before the character is retired for good. "We're halfway through writing and we can't tell you the plot because that would spoil it, but you'll see all the old favourites - and a couple more," he said. Gervais' writing partner Stephen Merchant said it would be the "same jokes, but with tinsel and David Brent in a Santa outfit". 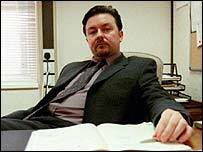 Gervais insisted that the upcoming episodes on BBC Two would definitely be the last outings for The Office and that he would never consider reviving it at any time in the future. Gervais told Heat: "If every project from this Christmas to when I'm fat and 50, as opposed to fat and 40, is the most abysmal thing ever, I still won't do that. This is the end of the story." The Office has won a multitude of TV and comedy awards since it first aired in 2001 including Baftas this year for best comedy performance and best sitcom. Gervais was also named the most powerful man in comedy in a Radio Times survey for his "legendary" and "peerless" work.